At legendary Road Atlanta, the maiden race season for the Porsche 911 RSR in the USA and Canada drew to a close with a significant success: Patrick Pilet (France) and Dirk Werner (Germany) secured the GTLM-class title in the prestigious North American Endurance Cup with the 510 hp race car. The long-distance classics of Daytona, Sebring and Watkins Glen as well as Saturday’s Petit Le Mans in the US state of Georgia count towards the world’s toughest performance and reliability competition in GT racing. With the 911 RSR, developed from scratch by Porsche Motorsport in Weissach for the 2017 season, the Porsche GT Team also won the team classification. Finishing second in the manufacturers’ classification, just one point off taking home the title, Porsche beat strong competition from Chevrolet, BMW and Ferrari. At the four long-distance races of the North American Endurance Cup, teams and drivers had to underline their consistency and reliability over a total of 52 hours. Petit Le Mans on the 4.087-kilometer Road Atlanta circuit also marked the last round of the IMSA SportsCar Championship, North America’s premier sports car race series. In the hotly contested ten-hour race, Patrick Pilet and Dirk Werner joined forces with a third driver, overall Le Mans winner Nick Tandy (Great Britain), to bring home sixth place in the GTLM class after 392 laps. 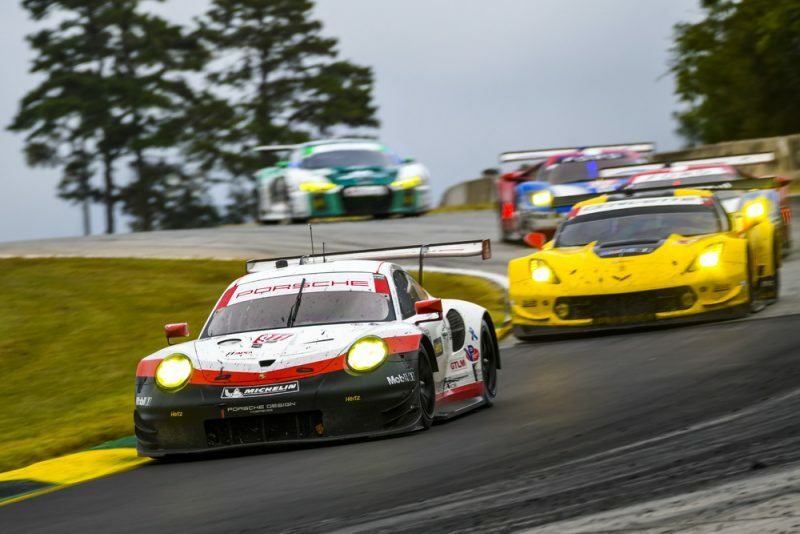 This result was enough for the drivers and the Porsche GT Team, who travelled to the race leading the points table, to win the North American Endurance Cup. After spending long stretches on course for a podium spot, their teammates Laurens Vanthoor (Belgium) and Gianmaria Bruni (Italy) were ultimately flagged off as fifth in the sister 911 RSR. The third driver in this car was Earl Bamber (New Zealand), another outright Le Mans winner from Porsche’s factory squad. During its maiden race season in the USA and Canada, the new Porsche 911 RSR had already notched up numerous successes. Its first victory came on 22 July at Lime Rock, with four podium placings at Daytona, Long Beach, Elkhart Lake and Laguna Seca as well as pole position at Bowmanville. At Petit Le Mans, Porsche customer teams contesting the GTD class with support from works drivers, concluded the season with a strong performance before heading into the winter break. Michael Christensen (Denmark) and his American teammates Daniel Morad and Michael de Quesada scored second place with the 911 GT3 R campaigned by Alegra Motorsports. Jörg Bergmeister (Germany) finished on third with the Americans Patrick Lindsey and Matthew McMurry. This season, both squads netted a victory each with the 500+hp customer sport racer, which Porsche Motorsport had developed for GT3 series worldwide: Alegra Motorsports won the 24-hour classic at Daytona, with Park Place Motorsports winning Lime Rock.